Downstairs at the terminal, we buy a three day travel pass for 11 euros. I ask for the Roma Card, a discount card giving you three days travel and entry into touristy places, but the girl says they don’t do them anymore. This turns out to be untrue, but in the end I don’t think it would have saved us much anyway. On to Metro A, one of only two lines that Rome has, and take it to Valle Aurelia station, about 8 along. I should mention at this point that I screwed with this booking. I went with the reviews, which said that this hotel was good. It is. However, I made the fatal mistake, unusually for me it has to be said, of not checking where the place was. It’s miles away. Seriously. As Lewis says, this is like going to London and staying in Strood. M25 territory. We change on to FM3 or FR3 (depending on who you believe), and head north-west out of Rome. City changes to countryside. Countryside changes to satellite town. Satellite town changes back to countryside. Oh dear! At Valle Aurelia, we head up several escalators, but there’s nowhere to buy tickets. We don’t think our transport cards are valid for trains. I try sticking it in the validation machine just for good measure. I’m given the “stupid tourist” sympathy look by the people standing nearby. No progress. I head down the three flights of stairs to check again, but there really isn’t anywhere. Fine, the train arrives despite the boards and clocks being all messed up, we hop on the train, which is covered in covered in graffiti. Half an hour or so later, we’re at La Storta. Nowhere to buy tickets here either. Oh well. It’s raining for the 600m walk to the hotel. We could take a bus. Of course, it’s becoming a bit of a joke by now. We find it though, it’s called Hotel Cassia and is on the Via Cassia, one of the old Roman roads running straight out of town. It’s nice, but the slightly mad old guy on reception had forgotten my reservation, despite remembering speaking to me. I have a coffee whilst he flicks through all the other reservations before agreeing that it’s no problem to accommodate us anyway. Good! Dump bags, and finding the internet costs money, we head back out, into town. We’re hungry. Lewis and I have a couple of slices of pizza at the station, Dad and Pippi end up with rather dull cheese and tomato sandwiches at St. Peter’s Station, before we hit the first big gun – St. Peter’s, i.e. the Vatican. 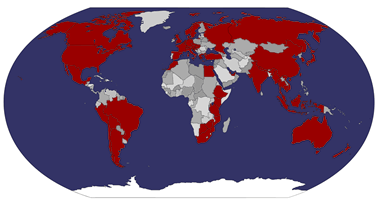 The Vatican is the smallest country in the world, by population and area. Apparently about 800 people live in it. There are large old walls surrounding it, but no border as such. The square in front of St. Peter’s is enormous. It’s also raining hard. Lewis and I have both been here before, but can’t remember the drill. The information desk soon puts us right. So across the square, we don’t join the queue for the basilica, as the inside tip is that you go to the Vatican Museums first then cut straight across to the church (and up the dome). So through the enormous columns and round the high Vatican City walls. There’s almost no queue, unlike last time Lewis was here. Still plenty of groups of school kids inside though. Lewis and Pippi get a student discount, and I think he was going to give it to me too. Through security, and in. LP says you can easily spend several days here, and it’s true. and it gets busier and busier before finally we arrive at the Sistine Chapel. 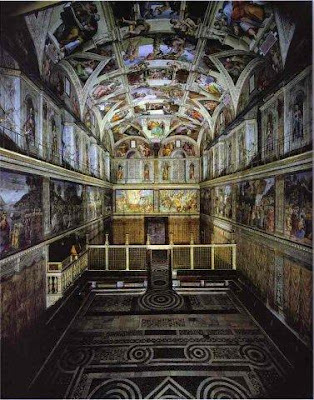 The Sistine Chapel is the room where the cardinals are locked in to choose the next pope. It’s famous for its ceiling, painted by Michelangelo, along with other works of his and others. Disappointingly photos are not allowed. The chapel is crammed with people, and it’s easy to see why – the ceiling is magnificent. 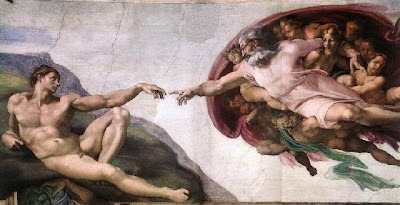 Lewis spots the famous God creating Adam bit. We exit via the “organised tour groups only” exit, straight into St. Peters, where we pay 5 euros to climb without lift (7 with). Lewis and I have warned the other two that it’s a fair climb, quite high up, and not great if you’re claustrophobic, all of which seems to be an issue for the other two. This is by most measurements the largest church in the world, with the biggest dome. The church itself holds 60,000 people, or far more when the square in front is packed with people for Papal addresses. We climb up a gentle spiral first, around a lift shaft, before we meet the base of the dome on the inside. There’s a good view from here down the long drop into the main church. I don’t like looking down much here! Then we ascend a tight spiral before effectively climbing up on top of the dome. This is the bit where the width closes in, and you are forced to lean on the side which you know is the dome with the big drop below. I don’t like this bit at all! There’s then a really tight corkscrew climb up to the top. Well actually there’s another level, but the staircase to this one is a joke, it must be about 12 inches wide, there’s no way I’d get up it, and anyway it’s not accessibly to the public. From here, one has a wonderful view over all of Rome, with St. Peter’s Square below where crowds gather for the papal addresses, the Tiber river flowing through the city, the Coliseum, Pantheon, it’s all there to be picked out. Unfortunately two of our group wouldn’t go anywhere near the edge, despite the strong railing around the outside. I must admit that I must have mellowed lots, as last time I remember being really panicky – Huey-mien was laughing at me, but this time I feel quite relaxed. There are hooks on some of the pillars on the inside which Dad grips! The other side one can see various Vatican buildings in beautiful gardens. Perhaps the pope’s residence? I don’t know. Down to the level at the back of the façade, where the disciples gaze down at St. Peter’s Square. We head down to see the church. It’s enormous inside. We rub the foot of St. Peter. This clearly is the thing to do, and the poor chap’s foot has had to be replaced as it gets worn off over time. There’s a service going on at the end, which I find a bit spooky – the synchronised way in which everyone suddenly stands up and chants. Organised religions, they’re all a bit strange.